Find the Perfect Chair for You! 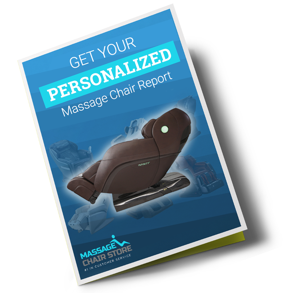 There are a lot of different models of massage chairs to choose from, and sometimes comparing options can be overwhelming. That's why we have a team of fully trained Massage Chair Specialists ready to answer all of your questions and help guide you to your perfect chair. Your specialist will get to know your lifestyle, budget, and unique pain and stress levels, and use that information to evaluate which features will have the most positive impact on your overall wellness. Whether you have a quick question or need more thorough assistance navigating your massage chair buying process, we'd love to hear from you. Fill out the survey to the right to find your perfect match AND receive free white glove delivery with purchase! If you have more questions, please give us a call at 877-633-9055, and our massage chair specialists will be happy to assist you. Fill out this survey to receive a custom report of your top 5 matches!